Early last week I took a plane to Huntsville, AL to join up with my BFF Leslie Reed of Keel Mtn and Kathy Davis of Dwysan for a fun-filled 12 hour road trip to Huron OH for the CWCCA National Specialty Show. I was short on time off at work so we weren’t able to make it in time for the Sweepstakes competition but we got updates from Helen and Facebook friends as we were driving thru Alabama, Tennessee, Kentucky and finally Ohio. Our pretty boys didn’t get placements in sweeps but they showed well from all reports. We arrived at the Sawmill Creek resort on the shores of Lake Erie and met up with the final member of our foursome Helen Keever and checked into our very nice suite, I said it was like a sorority house so we became the sisters of Sigma Cardi. The venue was fabulous and the Nationals Hosts did an amazing job, well done and THANK YOU! Handsome Rider in the 15-18 month class, a cellphone shot from ringside, better photo to come. On Thursday the boys showed again this time in the regular dog classes, both Rider and Owyn only need single points to finish their AKC Championships but the decision was made to not finish them before the nationals so they could compete against the other young dogs. The incomparable Sheri Hurst took both boys in and they were both awarded 2nd place in their classes. I was excited since any ribbon at the nationals is an honor. Bailey who was the 1st of my breeding entered at nationals got a ribbon last year and this year Rider did too. Of course Harry’s Oz won winner’s dog last year but it was good that both Rider and Owyn were in the ribbons this year too. 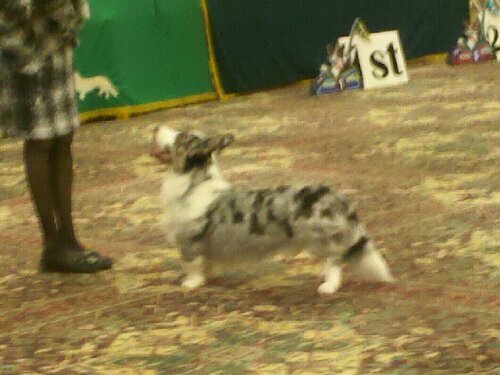 Here is another blurry ringside photo of Owyn. On Thursday Kathy Davis and I attended the CWCCA Board of Directors meeting, Kathy was rotating off the board and I am in my second term as corresponding secretary, then we were off to the annual club meeting. On Friday it was the girls turn and we spent the day ring side watching dogs, imagine that! On Friday night I presented Rider at the judges education seminar that aspiring judges attend to learn the finer points of judging the Cardigan Welsh Corgi, Rider was a handsome example of the breed and he behaved very well for me. He hasn’t lived with me since he was 8 weeks old but he was good for his Mom anyway. Saturday was all about the Breed, what a great bunch of dogs, it was exciting to see all the quality dogs being exhibited and what a thrill to watch the marvelous Harry P win the nationals for the 2nd time, this time from the Veteran’s class at 12 years old with his breeder/owner at the end of his lead. Harry P is Frosty’s Grandpa so it was a family win. After that excitement it was time for the last event of the nationals with the banquet and silent auction, I ended up with some great older handbooks from the silent auction and we had a good time looking at both the dogs and the much younger people in the photos. Sunday morning saw us scraping ice off the windows, saying goodbye to Helen and piling into the car for the 12 hour drive home, it was cold and we were ready to head south to warmer climes. Actually the road trip was a much fun as the event itself since I got to spend some quality time with my girls! The true purpose of the a nationals is to expose other breeders to your breeding program and look at where others are at in theirs. It is also a big family reunion where friendships are renewed and made. A place where dreams start. I had the good fortune of meeting with new and old friends and seeing some dogs I hope to bring into my lines, I kept telling people we were just a bunch of crazy chicks looking for studs and a party and that is exactly what we did. I have chosen a sire for Banner’s 1st litter, a handsome black dog name Rush and I am talking with his owner Heidi about the breeding, you can see Rush here http://www.regentcardigans.com/html/rush.html. I know Leslie and Kathy also saw some boys they want to look at for their own programs, yep that is what the nationals is all about! So that is a wrap for the 2012 CWCCA national speciality show and next year it will be in Tucson, AZ where yours truly will be acting as host/Chair of the event. Yes, a good time was had by all!